Background: The TPP technology is a “nano-optics” 3D printing technology that develops in recent years. Compared with the traditional 3D printing technology, the TPP-3DP technique that takes near-infrared light femtosecond pulse laser as the light source can break through the limitation of optical diffraction and manufacture nanoscale 3D structures in arbitrary shapes with high resolution. Method: The research develops a claim-based patent analysis method to identify technical features via the analysis of claim, especially the analysis of plural elements of independent claim. Furthermore, we analyze the subject matters and technical features of claims through claim-base analytical method to observe the patent trend of competitors and understand the current situation of competitors’ technical distribution in related industries, in order to provide useful information for enterprises to determine R&D strategies. Results: The result shows 3M Company possesses numerous patent portfolios that base on the diversified innovative applications of TPP technology. Nanoscribe Company has a long-term advantage in monopolizing this technology. The patents in TPP-3DP field can be grouped into five categories relating to application, including micro-optics device, photonic crystal, biomedical, microfluidics and MEMS. 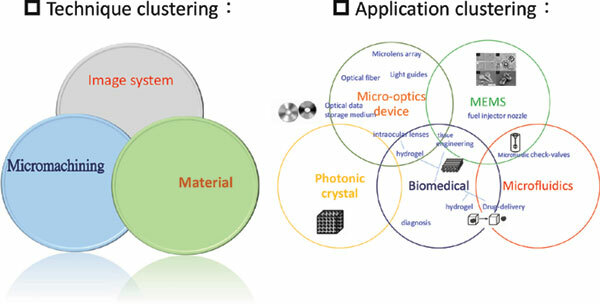 Conclusion: The findings of this review confirm the TPP-based 3D printing (TPP-3DP) technology has broad application prospects, of which the hydrogel material applied in tissue engineering and drug delivery is the future trend. Highly-initiated water-soluble initiators are particularly needed to increase its resolution and will be the direction of emerging technology in this domain. Two photon polymerization (TPP), TPP-based 3D printing (TPP-3DP), claim, independent claim, nanoscale, patent analysis, patent deployment, patent retrieval.